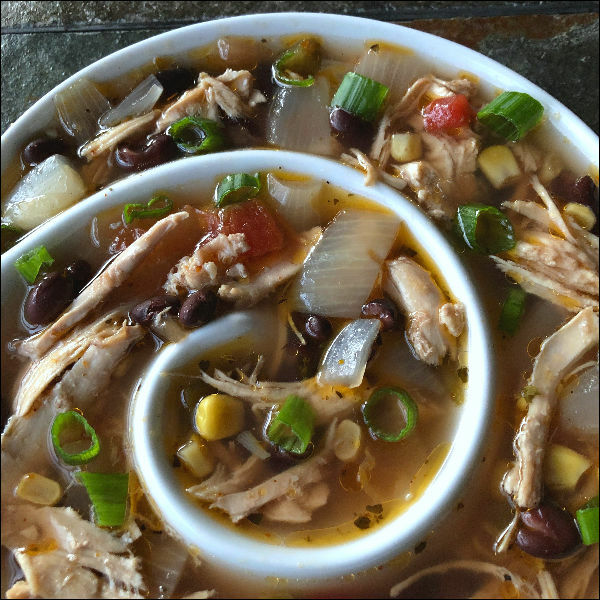 This naturally gluten free Salsa Chicken Soup recipe has a little underlying heat, plus the depth of flavor that comes from simmering a whole chicken. This simple soup recipe makes a huge pot of comfort food on a cold winter’s day. Who’s in the mood for a big pot of comfort food? 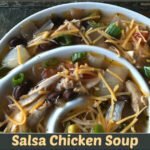 There’s nothing better than hot soup on a cold day, and this Salsa Chicken Soup recipe fits the bill perfectly. 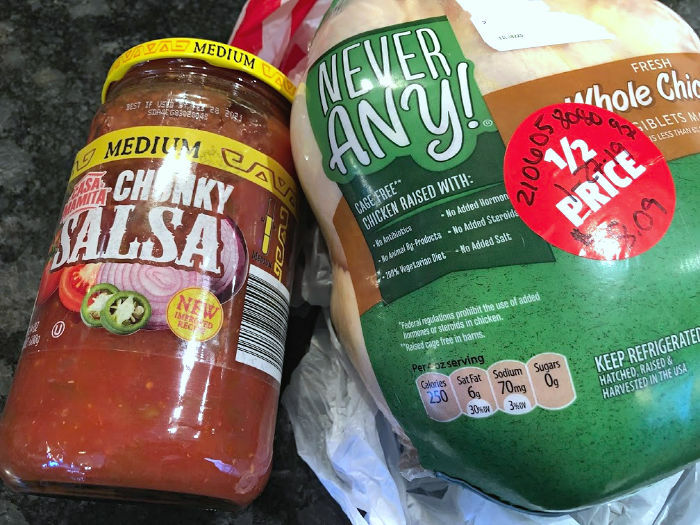 This week I was inspired by a clearance whole chicken plus a jar of salsa I picked up on sale at ALDI, so decided it might be a bit tastier to use both of these in paying a little more attention to a pot of salsa chicken soup on a lazy Sunday afternoon. 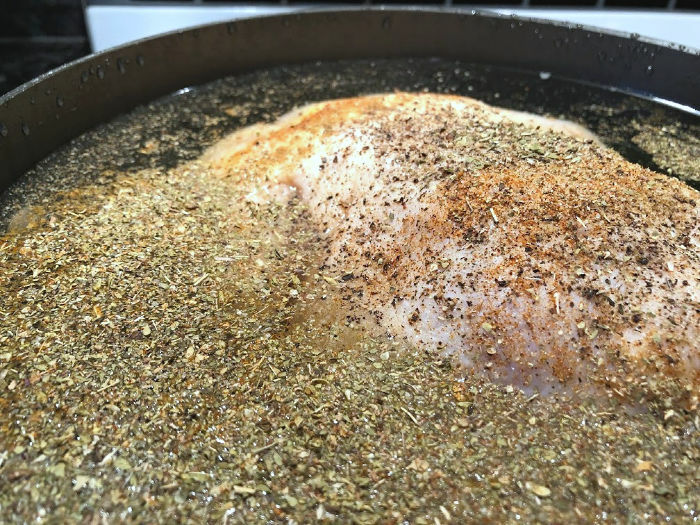 This is still an easy recipe, but devoting the extra time and starting with a whole chicken help to give it the depth of flavor you find in a good chicken soup, combined with the mildly spicy goodness of salsa. You can optionally jazz up your finished soup with shredded cheese, chopped green onion, sour cream… or, really, any toppings you prefer. Think about what you like to add to your chili or to any soup with a bit of heat, and go from there. Remove chicken giblets, if present. 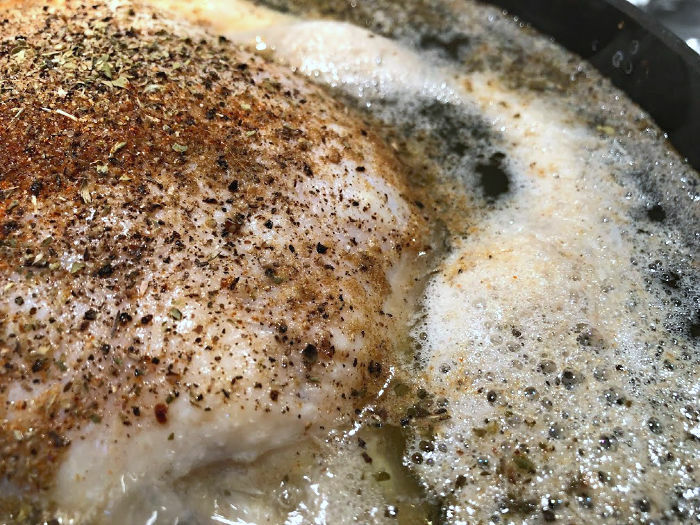 Place the chicken breast side up in a large pot, then add enough water to nearly cover. Season with 1/2 tsp seasoned salt, 1 tsp oregano, 1/2 tsp cumin, and black pepper to taste. Bring to a boil. Skim any foam off the top and discard, then cover the pot and reduce heat to medium-low. Simmer for about 90 minutes or until chicken shreds easily, stirring occasionally and skimming again as necessary. Remove chicken from pot and let it cool slightly. 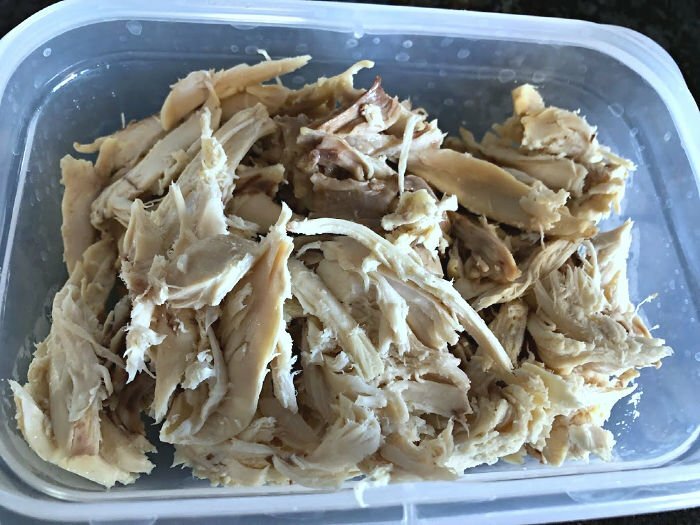 Shred chicken (see Note), discard the skin and bones, and return the cooked shredded chicken to the pot. Chop your onions. Add onions, salsa, corn, beans, garlic, bay leaf, 1 tsp chili powder, 1/2 tsp oregano, and 1/4 tsp cayenne to the soup pot. Stir, cover, and continue simmering on medium-low for another hour, stirring occasionally, or until onions have softened and flavors have blended. Discard bay leaf. Serve the salsa chicken soup topped with shredded cheddar, sour cream, diced avocado, chopped green onion, tortilla chips, and/or other toppings of choice. Note: I actually used a larger 5+ lb chicken here, so I could reserve some of the cooked shredded meat for a second recipe. I always like to cook up a little extra like this when making soup from a whole chicken, so as to have some left over for another meal! If using a smaller chicken, though, return all of the cooked chicken to the pot after shredding. Now, that’s a lot of soup! But we’ll look at this as a bonus: Leftovers for the win, right? 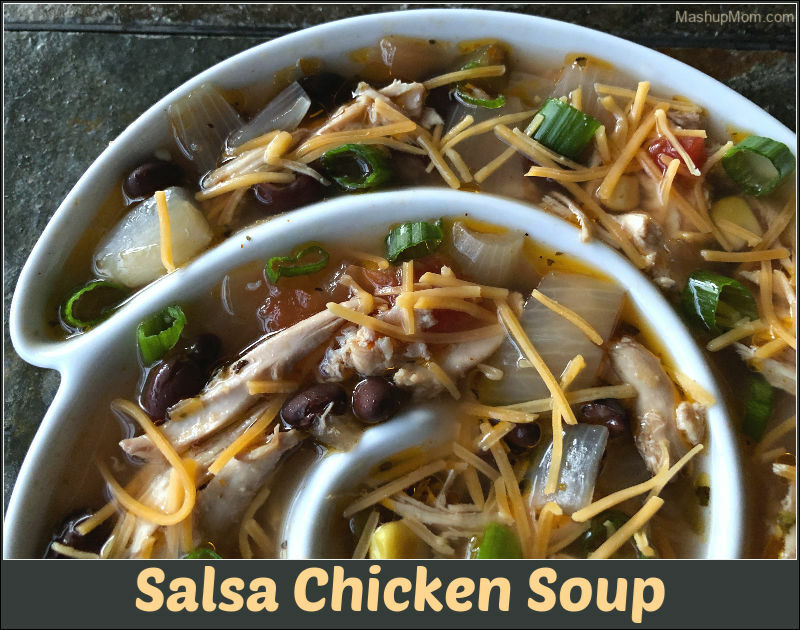 (I just had a bowl for lunch, myself…) Salsa chicken soup is the perfect easy soup recipe to simmer away on your stove on a lazy Sunday afternoon, giving you a comfort food dinner to look forward to all day. This savory salsa chicken soup recipe is naturally gluten free, and simmering a whole chicken to create the broth adds so much richness + complexity to the final flavor. You can control the heat level here with the type of salsa you choose; with the medium salsa used here, the soup wasn’t spicy but did have just a little underlying heat to it. This naturally gluten free Salsa Chicken Soup recipe has a little underlying heat, and the depth of flavor that comes from starting your soup by simmering a whole chicken! Bring to a boil. Skim any foam off the top and discard, then cover the pot and reduce heat to medium-low. Simmer for about 90 minutes or until chicken shreds easily, stirring occasionally and skimming again as necessary. Chop your onions. 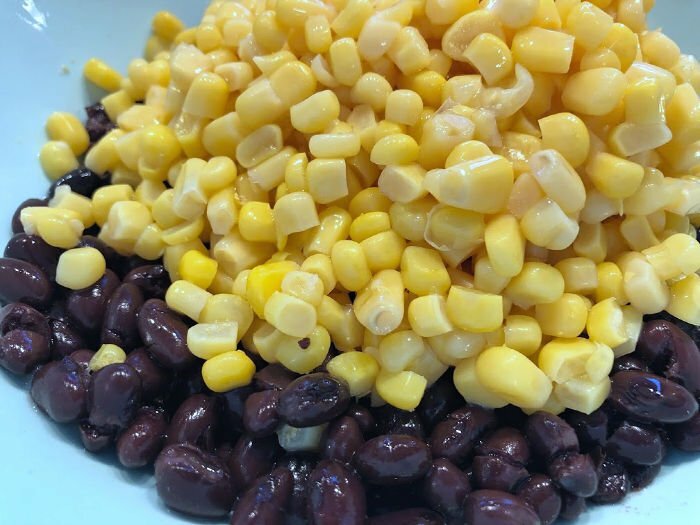 Add onions, salsa, corn, beans, garlic, bay leaf, 1 tsp chili powder, 1/2 tsp oregano, and 1/4 tsp cayenne to the soup pot. Stir, cover, and continue simmering on medium-low for another hour, stirring occasionally, or until onions have softened and flavors have blended. I actually used a larger 5+ lb chicken here, so I could reserve some of the cooked shredded meat for a second recipe. I always like to cook up a little extra like this when making soup from a whole chicken, so as to have some left over for another meal! If using a smaller chicken, though, return all of the cooked chicken to the pot after shredding. 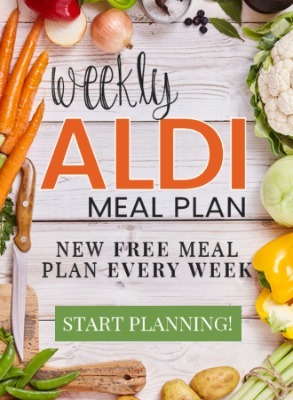 And be sure not to miss the free weekly ALDI meal plans, which show you how to use these recipes to meal plan affordably and realistically for your family. The recipe mentions cumin but I’m not seeing when you add it to the soup listed. I’m guessing with the chili powder and cayenne but I’m second guessing that based on where on the ingredients it is listed. Can you let me know? Sorry — at the beginning with the oregano and black pepper. I just updated to clarify, sorry for the confusion! I want to know where I can buy that bowl!! LOL – I got it at Goodwill, of all places, but it’s a Crate & Barrel dish originally. Could this soup be cooked in the slow cooker or instant pot?